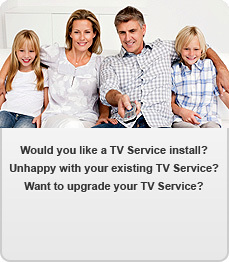 TV Services are your local TV/Satellite specialist for installation and repair of new and existing TV systems. We provide our customers with the full range of Digital TV options available on the Irish market. With over 20 years experience in the Irish TV industry, you can be assured of a quality and efficient response to all your TV requirements whether it’s Saorview, Satellite Digital TV, and Free to Air or Sky Digital TV. We have carried out many projects all over Ireland with the majority of our work completed throughout Counties Galway, Westmeath, Offaly and Roscommon.